## MOVES YOU. IN EVERY WAY. Progressive design that’s strikingly unique – and effortlessly capable. Intelligent technologies that help make the most of every drive. A standard rear view camera. SYNC® 3 enhanced voice-activated technology1,2 that helps you stay connected to the people and things that matter most. Plus, EcoBoost® power. (1) And spacious seating for up to 7 with surprisingly polished interior refinements. The 2017 Ford Flex combines them all to move you in every way that matters. Go further. Move people and cargo with ease. The PowerFold® 3rd-row seat is activated with a button located in the rear cargo area. Fold one or both sides of the 60/40 split 2nd-row bench seat to fit passengers and cargo. Fold 2nd- and 3rd-row seats down to provide up to 2,356 liters of cargo space. Behind the 50/50 split 3rd-row seat, Flex offers up to 566 liters of cargo space thanks to the extra room provided by its deep storage well. With bold FLEX lettering on the hood and liftgate, and incredibly versatile features inside, Flex is designed for busy families on the go. COMFORTS. WITH ROOM FOR UP TO 7. Flex impresses all around with choices to suit your lifestyle. Choose from cloth or leather trim. (1) The 2nd-row bench seat provides seating for 3, or opt for the 2nd-row bucket seats(1) with a pass-through to row 3. And from the back, you won’t miss out. Every rear seating position offers plenty of leg room and, with auxiliary rear climate control that provides separate controls for the rear seat area, it’s a comfort that feels tailor-made. Plus, maximize your time or entertain the group with the Dual Headrest DVD by INVISION™(1,2) that includes noise-canceling wireless headphones. Game system compatibility lets you go from workday to weekend with ease. Take it on the road in Flex. RESPONDS. AT THE PUSH OF A BUTTON. With your Intelligent Access key tucked away in a briefcase or pocket, you can touch the chromefinished door handle on Flex Limited and the door unlocks. Recall your favorite settings on the 10-way power, leather-trimmed driver’s seat and power-adjustable pedals, both with memory. Then, press the brake pedal and push the start button to get your engine going. At your destination, choose the most convenient button to open the power liftgate: from the liftgate handle, on the instrument panel, on the remote control or inside the rear cargo area. Get responsive V6 horsepower when equipped with the twin-turbocharged, direct-injection 3.5L EcoBoost® engine. 1 Paired with Intelligent all-wheel drive (AWD) and steering wheel-mounted paddle shifters, this 360-net-PS2 EcoBoost delivers a spirited performance. With its 3.5L Ti-VCT V6 engine, Flex has a combined rating of 10.9 km/L.2 Twin independent variable camshaft timing helps the standard V6 produce 272 net PS.2 And the 6-speed SelectShift® automatic transmission allows you to shift for yourself, or leave its fully automatic operation to Flex. 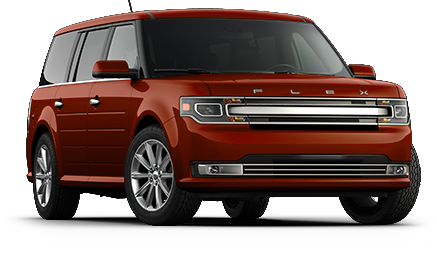 An unconventional blend of style, space and smarts, the 2017 Ford Flex is the modern way to move.